Over the years, many of us have witnessed the rapid transformation in modes of communication; from the postman bringing letters, telegrams and money orders to our doorstep to telephones, cordless and mobiles phones ringing incessantly in our homes today. 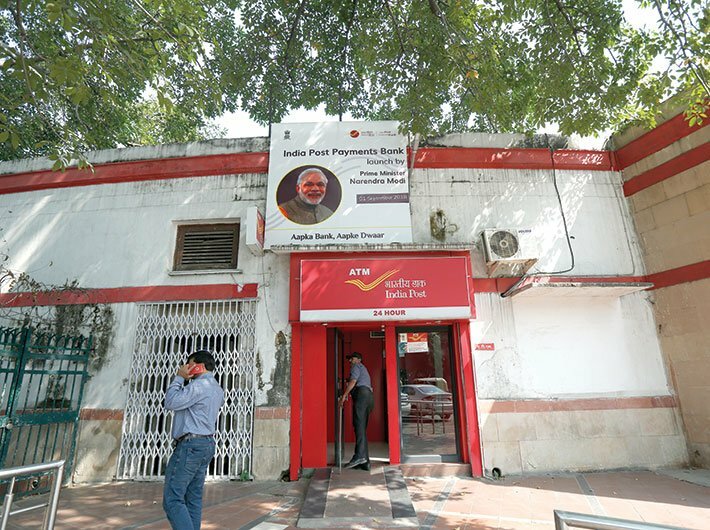 India Post, commonly known as ‘the post office’, however, has also been a trusted destination of low-income families for their small savings. The role of post offices had a turnaround in 2015 when the RBI, based on the Nachiket Mor Committee’s recommendations, granted the ‘payments bank’ licence to India Post. The government of India officially launched India Post Payments Bank (IPPB) on September 1, 2018 to make formal banking and financial services accessible to every citizen of the country. The NDA government decided to sustainably exploit the 1.55 million post-office points in the country to achieve its goal of financial inclusion. It is an innovative gradation in the role of post offices in India which will go down as one of the revolutionary initiatives taken by any government over the past decade to achieve financial inclusion and enable quick payment services in rural India. According to the World Bank, the ambitious programmes of the government like Jan Dhan Yojana (JAM) and other financial inclusion schemes have increased the number of account holders in the country. 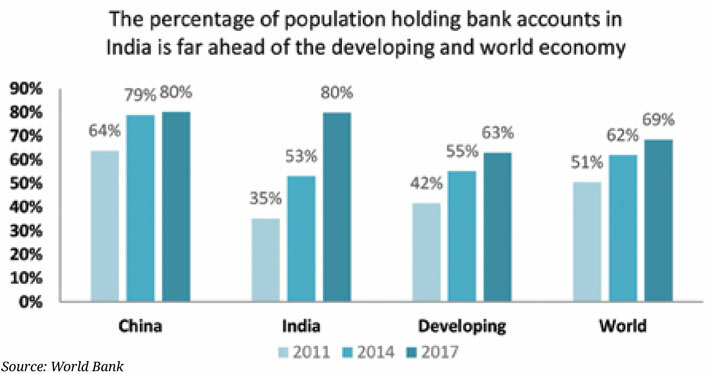 As per the 2017 Global Findex database published by the World Bank, proportion of the population (aged 15 years and above) with accounts in India has increased from 35 percent in 2011 to 80 percent in 2017. However, more than 40 percent of these accounts remain unused due to various issues concerning accessibility and affordability. Also, 18 percent of the population or 19 crore adults remain untouched by the formal banking system today; majorly due to the lack of financial institutions in close vicinity or/and expensive financial services. Majority of this unbanked population resides in rural India. India Post Payments Bank, characterised with accessible and affordable banking services, is one of the most effective means to strengthen the financial inclusion in the country. It is launched as a bank for small deposits with no credit services. The bank is facilitating a range of financial products and services like savings, current accounts, online banking, mobile banking, SMS banking etc. accessible to all. IPPB would deploy 11,000 postmen, who would now transform into the role of banking correspondents (BCs). Besides, IPPB account can also be linked with the government’s saving schemes like Kisan Vikas Patra, National Savings Certificates, Senior Citizen Savings Schemes, etc. Since payment banks have an upper cap of Rs 1 lakh on deposits, any amount exceeding the same can be transferred to the linked post office savings account (POSA). This will make the post office services hassle free for the customers. The account holders are given quick response (QR) cards for transaction purpose which will also act as passbooks. Furthermore, the user need not remember the account number and password as biometric authentication would suffice the transaction requirements. People can conveniently deposit, withdraw, transfer money and pay bills with the help of postmen at their doorsteps. Small merchants in the unorganised sector can also connect to the formal banking services by opening a current account with IPPB. Besides, the option of online mobile banking is going to make the use of IPPB convenient for tech-savvy individuals. Utilising the country’s post offices and their staff characterised by high penetration in the rural India is a well thought-out initiative. Such doorstep assistance from IPPB would also bring down the opportunity cost of availing financial services for low-income households and female workers in particular. IPPB, tested out on a pilot basis in Raipur (Chhattisgarh) and Ranchi (Jharkhand) in January last year, is now rolled out pan India with 650 branches and 3250 access points. The branches aim to penetrate remote regions by integrating with 1.55 lakh post offices in the country. The wide network of post offices located across the country makes IPPB different from the other payment banks. Last mile connectivity can play out to be the greatest strength of IPPB, as post offices, indisputably, have deeper remote connectivity in terms of services and physical infrastructure. Physical infrastructure and manpower which are already in place would minimise the fixed cost to the government in delivering the financial products and services to the remote regions. This payment bank model, if executed efficiently, is likely to bring profit to the Department of Post and further aid existing post office saving schemes of the department. Postal operators have been carrying out banking operations around the world. Countries like Japan, New Zealand, Switzerland, France, China, South Korea, South Africa and Morocco are some of the examples where post banks are running their operations and have successfully reached out to the rural unbanked masses. India has seen a massive growth in banking account numbers as proportion of its population in last few years. Schemes like Jan Dhan Yojana have resulted in a record growth in the bank accounts numbers. However, a high proportion of such accounts continue to remain unused. In fact, the percentage inactive accounts, i.e., with no deposit or withdrawal over a year, has remained high and risen from 42 percent in 2014 to almost 48 percent in 2017. IPPB through its unmatched network of post offices can fill this gap in the entire scheme of financial inclusion. However, frail digital infrastructure in rural areas coupled with inadequately trained postmen and staff can impose serious challenges to the scheme. A robust digital infrastructure with good network connectivity is needed to enable quick payment services. The army of postmen requires periodic training sessions so that they adapt to the fast changing technologies and applications. Very importantly, the Post Payments model must generate profit and remain viable in the long run. Being a payment bank, IPPB cannot lend credit to the customers and therefore the revenue model of IPPB has to be monitored closely in the future. The central bank has already allowed IPPB to partner with third parties to extend small credit products like loans, investments and insurance to everyone including the vulnerable sections of society. A dynamic and flexible financial institution is the key to the future success of IPPB. Adaptability towards forthcoming technological advancements and skill requirements is pivotal to the sustenance of the institution. Post office or India Post has the potential to be an effective medium for harnessing the savings of rural India and is further going to aid the government in making India a less cash-driven economy and to promote digital payment. Financial inclusion is known to play a crucial role in eradicating poverty, improving livelihoods and uplifting status of women in the society. IPPB is a great stride made by the government in this direction that seeks to connect people to formal financial services and move India closer towards accomplishing the UN Sustainable Development Goals and targets by 2030. Singh is a Young Professional with the Economic Advisory Council to the PM. Views expressed are personal.